This post is part of my challenge to bake my way through all the challenges of the Great British Bake Off. The challenge below is the showstopper challenge for week five (pie week) of series three: an American pie. There are many types of people in the world, and many ways of sorting through them. One of them is what I think of as ‘the bruschetta test’. Bruschetta is an Italian word, and, in Italian, the ‘ch’ is pronounced as a hard ‘k’ sound: brus-ketta. There are people who know this, and people who don’t; and people who are very relaxed about how to say it and people who deliberately pronounce it, with much pleasure, in the most authentic way possible. Which is all well and good, if you’re speaking Italian, but if you’re saying ‘pass the bruschetta’ at a dinner party in the English-speaking world, I…do not think it matters at all if you pronounce it ‘broosh-etta’. It’s inevitable that when a word is borrowed from another language that its pronunciation is massaged a little to fit more readily into the borrowing language’s flow and rhythm. I actually find that pronouncing ‘bruschetta’ in the Italian style sounds a little jarring in English. Maybe this relaxedness about ‘mispronunciation’ comes from me being a native Dutch speaker: if there’s one language a native English speaker mangles to distraction, it’s Dutch, with its plethora of guttural, back-of-the-throat sounds, its rolled Rs, and the spattering of French-style inflections. This really is taking pedantry to the next level – in the UK, at least, ‘key lime pie’ now just refers to a particular style of pie: I doubt most people would even know that ‘key’ refers to a particular type of lime grown in the Florida Keys – and even if we do know, getting hold of them is very difficult. It did make me smile, not to mention shake my head, because Brits have had, after all, to accept that they’ve lost the battle on how to pronounce Worcestershire. The pie I chose to make was a recipe from Brooklyn-based pie shop Four and Twenty Blackbirds: a malted chocolate pecan pie. I love a traditional pecan pie, with its translucent, almost gelatinous filling of brown sugar custard holding cupfuls of pecan pieces, but the Four and Twenty Blackbirds version has depth and gravitas, anchored by the addition of deep dark chocolate and the sticky, comforting flavour of malt. It was a wonderful pie, but I would add that you do need to follow their (meticulous!) instructions on chilling the pie crust. I don’t have a freezer, and my fridge was broken and consequently not very cold when I made this; as a result the pastry started melting before it set in the oven and I had to perform some hasty surgery. Nonetheless, it was absolutely delicious: sticky, chocolatey and much less sweet than a typical pecan pie. You will need to buy malt extract for this recipe, which I bought ages ago at Holland and Barrett, but I see it a lot in almost all health food shops. This post is part of my challenge to bake my way through all the challenges of the Great British Bake Off. 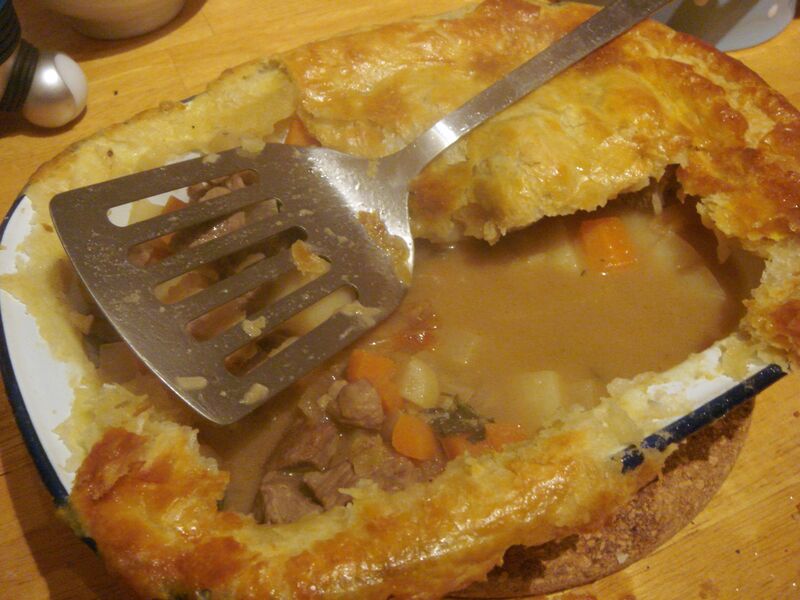 The challenge below is the technical challenge for week five (pie week) of series three: a hand-raised pie. The Great British Pie of picnic fame is not a soupy affair topped with buttery pastry that breaks into flakes and shards: the quintessentially British pastry is of course hot water crust. Hot water crust turns everything you know about pastry on its head: hot fat and water are sloshed into water to make a paste, which is kneaded – kneaded! – until smooth, then used almost immediately lest it dry out and crack. No resting, no turning, no coddling in the fridge. It can be – as Gavroche would say – tough on the teeth, but what the hell. It’s a strong, durable carapace and I find it can hold slightly wetter fillings on account of this without collapsing in the oven. I was a bit hesitant about making this pie, namely because I don’t love chicken and am actually quite repulsed by meat jellies. However, with equal parts bacon to chicken, the taste of the chicken is not particularly pronounced (even though I only used thigh instead of the mix of breast and thigh as instructed in the recipe). The bacon also makes the pie very salty and for this reason I have omitted the instruction to season the filling with salt: I love salty flavours but, hand on heart, do not feel that this needs more than what is already present in the bacon. It might be different of course if you are buying traditionally cured bacon, which is usually less salty, but mine was just from the supermarket. As to the jelly, in experienced hands it might trickle down snugly among the meat and provide an impervious, savoury seal around the meat, but in my case it just trickled down straight through the pastry, seeking out any structural flaws in the pastry (and, as it turned out, there were plenty). There were a few little shivery nuggets of jellified stock here and there, but I could scrape them aside without difficulty. My reservations about this pie are purely personal: my British boyfriend thought it was utterly delicious and happily took the remainder with him for his lunch. If you are a lover of savoury pies, something sturdy like this – or the pork and quail egg pies which have had a previous outing – would make for excellent picnic food. I do think that British culture really inculcates that love of savoury pies into its people, and it’s hard to bridge that cultural gap if, like me, you missed out on it in childhood. The episode of the Great British Bake-Off in which the pie was hand-raised shows the bakers struggling to shape the pastry around the pie dolly and, guess what, it is hard to do. The video which accompanies the recipe on the BBC site instructs you to set aside the just-made pastry for ten minutes before starting to mould it around the jam jars (you can buy pie dollies, but even for me, queen of kitchen paraphernalia, this was a step too far), though the written recipe gives no such suggestion. I tried several techniques in my attempt to get the damn pastry round the jars – at one point holding the jars upside down and patting the pastry down rather than up, for example. No method was perfect and removing the jars from the pastry was not as easy as the recipe made it sound. Finally, although I used the size of jar directed in the recipe and packed the filling in tightly, there was a scrap too much; maybe reducing the measure of meat to 280g each would do it. It was a ridiculously tiny amount to have left over. This post is part of my personal challenge to bake my way through all the challenges of the Great British Bake Off. The challenge below is the showstopper challenge for week five (pastry week) of series two: a meringue pie. During Wimbledon, it really gets crazy…and we eat strawberries and cream and root for our favourite tennis players. 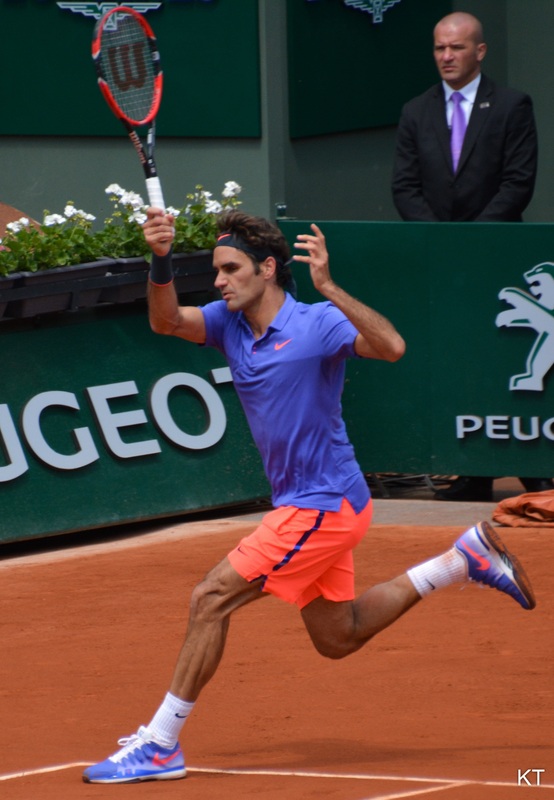 My boyfriend loves Roger Federer, and who can blame him? A beautiful man who plays a beautiful game. A man who can rock a cardigan and still look like a hero. Personally, I’m always behind Andy Murray, which can be hard to justify since he doesn’t…make a habit of winning finals. For me, Murray is like an intrepid and determined schoolchild who works incredibly hard to achieve his ambitions and to reach the upper echelons, while Novak Djokovich and Federer are like the cooler kids who do everything flawlessly while also dressing really well and dating the hot cheerleaders and make it look easy. Yes, they may be fantastic, but who has more heart, eh? Ladies and gentlemen, this is when personal psychology meets national sporting events. Because, let’s get real, Djokovich and Federer train incredibly hard too. But the more elegantly they play, the more I stubbornly root for Murray. (Though a part of me knows that only in tennis could you be ranked world number 3 and still be seen as a natural underdog). There is something elatable about that tenacity. Right, back to baking, since this is, after all, a food blog. But it’s a food blog where baking and tennis intersected, be it ever so briefly. When I was thinking up what kind of meringue pie to back for the old baking challenge, I kept thinking that what I really wanted to make was an homage to the classic accompaniment to the Wimbledon Championships, strawberries and cream (it sounds really random now because I’m writing this up months after the event, but I baked it to serve at a Wimbledon Men’s Finals viewing party). Well, it’s a classic for the viewers in the stands and at home – I doubt the players themselves are wolfing down sugary fruit and dairy once they return to their…tents/hotel rooms/wherever the hell they sleep. I mean, Djokovich doesn’t even eat gluten! Or tomatoes! Gluten and tomatoes – for the weak. Wimbledon grass – for the strong. So, strawberry pie it was, with a thick, marshmallowy layer of slightly sticky meringue. 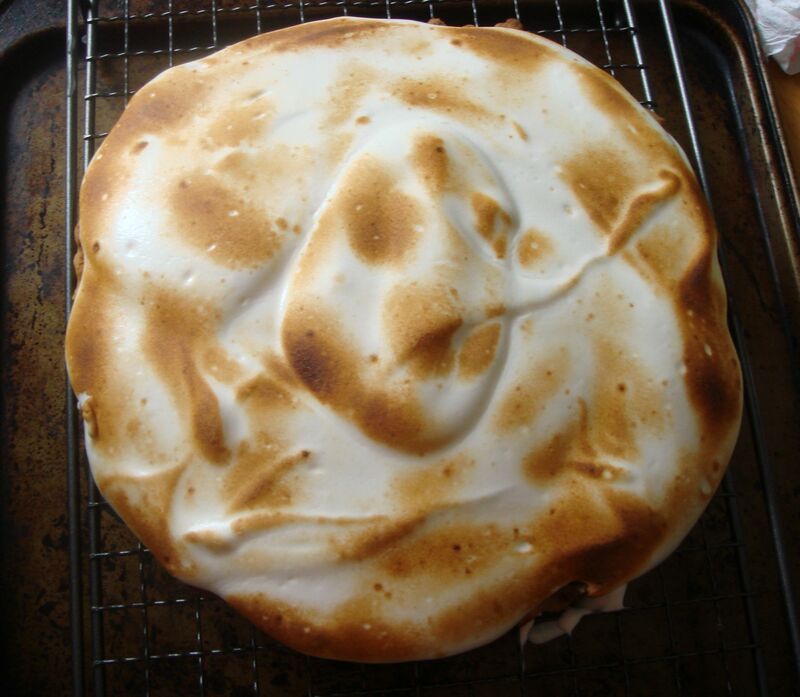 The meringue I made was blasted with a blowtorch, which gives it an amazing toasted, scorched flavour. In fact I blasted every mouthful with the torch to ensure my portions of meringue were as toasted as they could get. Divine. A torch gives much more control than a grill – especially my grill, which is more smoke than heat. I thought I’d made up strawberry meringue pie, as I’d never seen nor heard of it before, but no – people had gotten there before me. I contemplated making up my own recipe but opted for one from the enviably gorgeous Sift and Whisk blog. Blog envy: I have it. The photography, the lighting and styling – all beautiful. I’m more of a ‘throw on a plate, photograph for 30 seconds under murky yellow overhead light, eat dinner, wonder why photo isn’t all beautiful’. This pie is filled with both fresh strawberries and a fresh strawberry filling thickened with tapioca. The recipe calls for the tapioca pearls to be ground and, although I tried using my mini food processor for this, as directed, it’s difficult for the blades to grind down such a tiny amount, and I’d recommend pounding with a mortar and pestle instead. I struggled to find tapioca pearls in standard supermarkets and ended up buying a bag from an Indian corner shop, where, predictably, they had multiple sizes of pearls and I came away with enough tapioca for the rest of my life and change from £1.00. The recipe also calls for 1.25kg strawberries, and this was far, far too much when I made it. 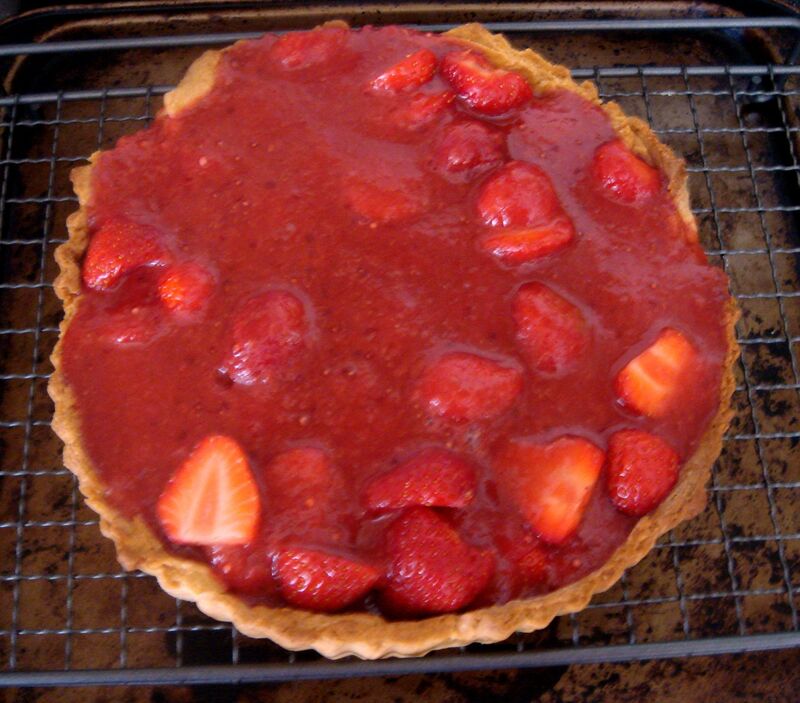 Since you both place cut strawberries onto the pie and pour over a strawberry puree filling, it really is much better to go by eye; once you have covered the circumference of your tart shell with the hulled berries, you’re done. I used slightly less than a kilo of strawberries in total, for both puree and whole fruit. Finally: this is not a bake, slice and serve pie; it really benefits from lengthy and patient chilling at each stage so that the filling can set. Perfect for a make-ahead dinner party, less for a quickly dashed-off dessert to present to people who’ve just dropped by (for that category of visitor, make scones!). If you serve it soon after baking and assembly, the pie will taste nice but be decidedly leaky/sloppy. Baking challenge: who ate all the miniature pork pies? This post is part of my personal challenge to bake my way through all the challenges of the Great British Bake Off. The challenge below is the technical challenge for week five (pastry week) of series two: make six miniature pork pies with a perfectly cooked (of course!) quail egg in the centre. 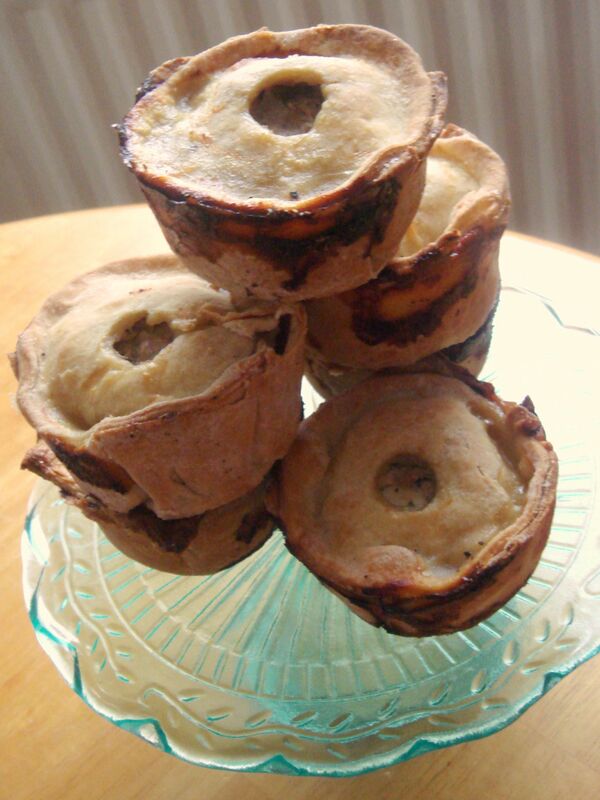 Pork pies – who doesn’t love them? They are an essential part of British food culture, an indigenous tradition – and, much like the mince pie, not one I have taken to. Dense pastry and pork do not set this non-Brit’s heart alight, and the combination of eggs and meat is one I have serious difficulties with. I grew up in Singapore and scarcely ate any Chinese or Malay food when I lived there, and I’ve realised that the ubiquitous addition of eggs to meat stews and laksas had much to do with eat. But to my British boyfriend and a dear friend these pies were truly delightful, with their fresh, meaty filling, the touch of bacon giving it depth of flavour, and the parsley a hint of freshness. For my boyfriend, the egg in the middle which was my personal nemesis was his favourite part – he described it as a ‘lovely surprise’ when he ate the first pie (as he wasn’t aware they were in there) and as something to look forward to. So there we go. It takes all sorts, really. I actually ended up repeating this recipe (both batches eaten gratefully by the boyfriend and friend), and so below can go into some extra tips I picked up along the way. Could have been more golden. A warning of sorts to those who may wish to try out this Paul Hollywood recipe for themselves: quail’s eggs are the very devil to peel. In the how-to video Mary recommends peeling the eggs as soon as they are cool, but even so I found it quite difficult. This recipe is made not with shortcrust pastry, but the more traditional hot water crust pastry, which starts off life sticky but becomes dry and brittle relatively quickly. Work fast. I covered it in a damp tea towel in between rolling and stamping out the pie cases and tops to ensure it didn’t dry out. Don’t rest it as you would a shortcrust pastry. Lard – used in the pastry – smells disgusting, especially when melted, so be prepared. A food processor makes it easier to chop up all the pie filling, though be gentle – you don’t want to end up with a smooth, homogenous paste. Finally, I found using jumbo muffin tins about a thousand times easier to make the pies in than a standard-sized muffin tin. Finally, reader – I did not make the gelatine. This was principally because the promised hollow or gap within the pie never materialised. My pies were crammed full of meat and egg and the filling didn’t shrink. It did bubble juicily out of the pastry, however, where it baked on sticky and black and actually looked quite appetising, I thought. 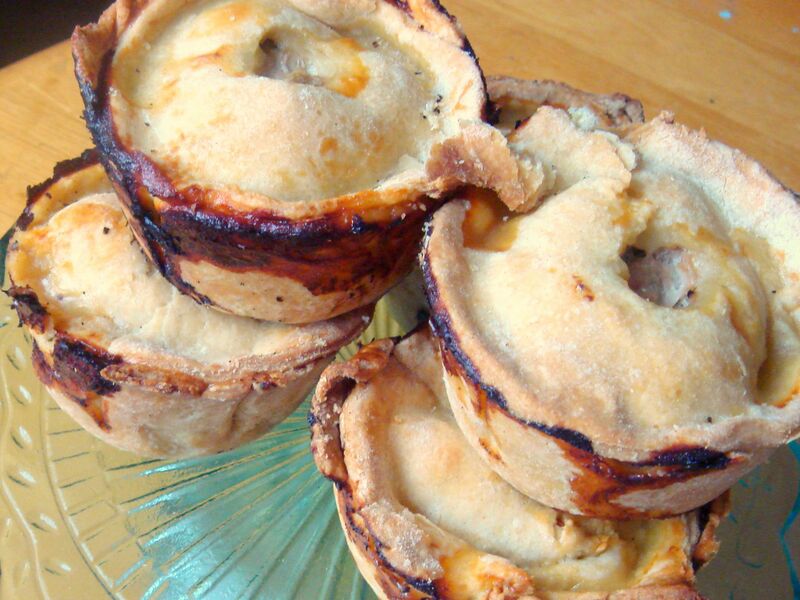 At risk of rambling I feel that I must add that although these are called ‘small pork pies’ they are by no means ‘mini’ – they’re small only relative to one of those huge full-size pork pies. I have moved into the penultimate episode of the first series of the Great British Bake-off, and the great thing about Pastry week was the opportunity to make savoury items. Usually, when I’m doing a challenge, I have to make sure I have people coming round to polish off an excess of sweet goods. With this one – although I did serve it up when I had a friend round – it could just be served up for an ordinary dinner. Very convenient. I actually made up the very same recipe for the signature bake that Ruth Clemens served up. This pastry episode was quite a funny one, both in the amusing and raised-eyebrow sense – Ruth made some comments which were quite controversial in various GBBO online fora (yeah, they exist), and there was some pointed editing going on to imply a Miranda-Ruth rivalry. Still, also served up by Ruth was a really cracking-looking beef pie, which even Paul Hollywood complimented despite being initially sceptical for its lack of sophistication. The recipe I took from The Great British Book of Baking, which I own because of a 2 for £10.00 deal at WH Smith’s (it’s a little disappointing in not having a huge amount of recipes from the show). The pie was surprisingly small and I was sceptical that it would actually serve four as stated in the recipe, a point which was agreed upon by my guinea pigs (there were three of us). The verdict was ‘might serve four if two of them are under eight’. I also thought there was a smidgen too much pastry for the recipe, and it was a little thick when I used it all. Although by the end of the suggested baking time the pastry was nicely browned and certainly looked cooked, it was actually a little underbaked in its centre at the bottom and the top, so I’d recommend another couple of minutes in the oven. I couldn’t remove cleanish slices from the pie but can’t remember if that was actually achieved in the show.